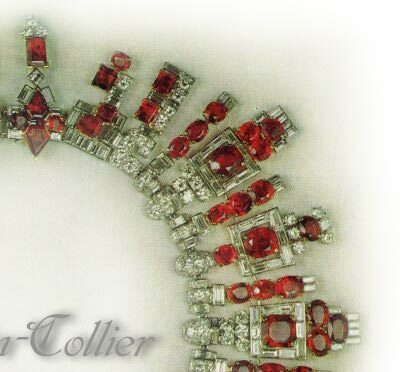 The splendid necklace was commissioned from Cartier in 1937 by Maharaja Digvijaysinhji of Nawanagar. He was the adopted son of the famous Ranjitsinhji of Nawanagar, who before his death in 1933, was a passionate collector of jewels and one of the world's best cricket players, playing for England and Sussex between 1985 and 1912. India's inter-state cricketing prize, the Ranji Trophy, initiated in 1934 by Maharaja Bhupindra Singh of Patiala, was named after him. When the young Digvijaysinhji succeeded the throne he inherited the fabulous Nawanagar State treasure. He maintained the close relationship with Jaques Cartier enjoyed by his father for twelve years and the firm continued to recreate jewels of the highest class. Indeed, in Wild's biography of Maharaja Ranjitsinhji, Jaques Cartier wrote an article entitled 'The Nawanagar Jewels'. 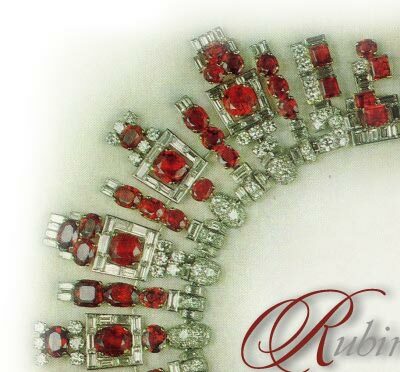 On the subject of rubies Cartier wrote 'If there was one precious stone about which it was possible not to agree entirely with the late Maharaja it was regarding the best colour for rubies. He liked them with a tinge of purple and his early purchases reflected this taste, but later he changed somewhat his opinion and bought some stones of the pure crimson which keeps clear of purple'. 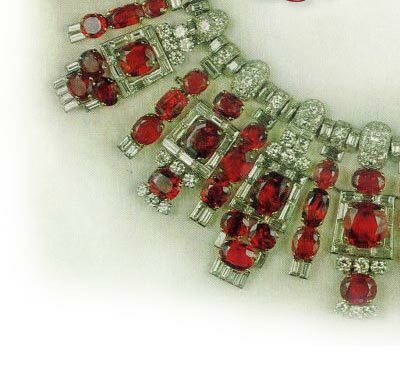 The rubies in this extraordinary necklace were supplied from the Royal treasury, Cartier supplied the diamonds, and the piece created to an original Cartier design - one of the more important jewels commissioned by Digvijaysinhji. In the early 1950s the necklace was returned to Cartier and re-offered for sale to an exclusive and select clientele. The wife of one such client immediately fell in love with the piece and after the purchase, had it slightly altered from the original design to fit her slender neck in the shorter, prevailing fashion of the time while maintaining the geometric design and the originality of the Deco period. Not only does this jewel have a captivating history but it is also special for another reason. One trend which was prevalent during the Art Deco period and which continues today is the rarity and scarcity of fabulous Burmese rubies. The 116 rubies in this piece, weighing over 170 carats, all originate from the famous Mogok mines of Burma, with their natural rich, deep red colour, bereft of any enhancement. 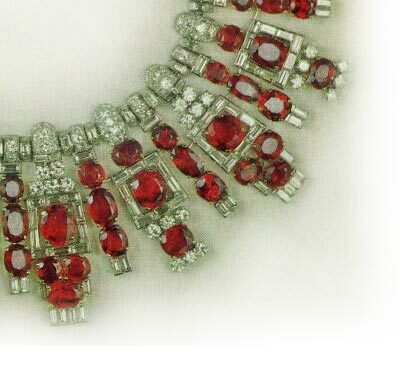 It rivals some of the most important ruby and diamond necklaces including the Empress Marie-Louise necklace from the Crown Jewels of France, the necklace from the estate of Vera Hue-Williams and the Belle Epoque ruby and diamond necklace that realised $1,375,000 at Christie's Superlative Jewels auction in May 1996. He was proud of his eight perfectly matched black pearls which had been collected over the years form Nawanagars`s own fishery, and he tresured a diamond necklace made entiredly of diamonds mined in Patna and cut in India. Another of his favourites was a necklace of emerald beads strung on gold wire which had been in the state treasury for generations. At the time, the Indian peninsula had a geographical surface of 4,735,756 sq. km. (today 3,287,263 sq. km.) and a population of over 352 million (today over a billion), of different races, speaking 6 main different languages (today 18 languages are recognized by the constitution), and practicing different religions. The country was divided into over 562 Princely States, each headed by a Raja, or Maharaja, Rana, Nizam, (all being names for king), whose magnificence and wealth are legendary.